For 2019, the best value in the business. Please check Pricing Page for details. Many changes coming. Also, I am working on a new site and my queue is no longer a 1 year wait. Please contact me for any questions. It started in the Summer of 2007. Since I was a kid, I'd been a Carver enthusiast, and in fact worked as a repair technician for Carver Corp. from 1988 to 1991. After retirement, I finally got around to re-building my stereo system. I knew I wanted a primarily two channel system, with a nod to home theater use, and I knew I wanted to use Carver amplifiers. After a less than happy experience with buying amps on ebay, I ended up with a pretty sour taste for the Carver second hand market. I was familiar with the Carver magnetic field	design, and could service my own equipment, but I decided to look into the idea of getting the most out of them (without changing their voicing or protection circuits). Nine months of researching datasheets and experimentation later, I had a stable, reliable and more powerful Carver amplifier modification; I call them the mk II series. For full details, or any questions, please visit the forum or send an email. The electrolytic capacitors in an amplifier's power supply and main board circuitry are consumable items. With time, the equivalent series resistance (ESR) slowly creeps up, not unlike human joints that stiffen with age. The main power supply capacitors are also subjected to extreme ripple current, and may become leaky or 'vent' corrosive electrolyte onto the surface of the board. Physical signs of bad capacitors are bulging at the tops of the capacitors, and/or a leaky brown sludge that may have corroded nearby components. Audible symptoms include an RMS rating that meets spec, but an extremely weak dynamic power rating. This equates to sloppy transients; akin to a grainy voice or 'rice in the drums' sound. 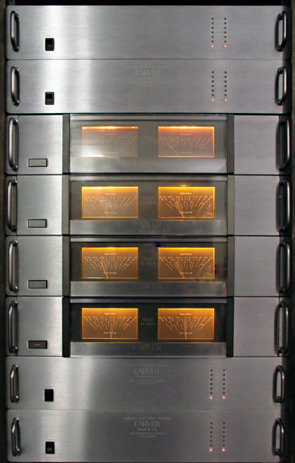 The expected lifetime of electrolytic capacitors is about 20 years; many of the Carver amplifiers being sold second hand are nearing the end of the line. When I was putting my own home theater system together, in 2007, I purchased four M-500t and four M-1.0t. Of the eight amplifiers I purchased in 'works great' condition, two were in decent shape and performed nicely. Four had bulging capacitors and sounded weak. One died within six months of purchase, and the last one was DOA with blown fuses, needing immediate repair. Not a good track record. The lesson learned is that recent service has more value than the specific model you are buying. A Carver unit that has been serviced at one of the few Carver capable electronics repair shops will be in 'as new' electrical condition, and will likely sell for $600 or more. Restore the amplifier yourself; you can get a good deal for about 18 hrs of your time. I can help walk you through it. Send the amplifier to a Carver aware service center. Most charge a flat fee of roughly $400. For your money, you'll receive a unit that performs as it did when new, and you'll be lucky to get a warranty longer than 90 days. Send the amplifier in for a Carver mk II upgrade. For your money you'll receive a unit that performs BETTER than new with a 3-year parts and labor warranty.